ANITA is an elegant wedding gown perfect for an unconventional bride who wants celebrate her wedding in black or - in the classical version - in white. ANITA BLACK STRAPLESS GOWN is very elegant with a hint of gothic style. Its sweetheart neckline will give you a diva allure. With its superfeminine rigid fitted bodice, covered with a fine tone-on-tone handcutted lace, ANITA dress shapes your bust smartly, so it can encase a prominent breast or lap a thin bust. Also ideal for occasions as a prom an evening ceremony, a special birthday party, a New Year's Eve, a red carpet and other important occasions. 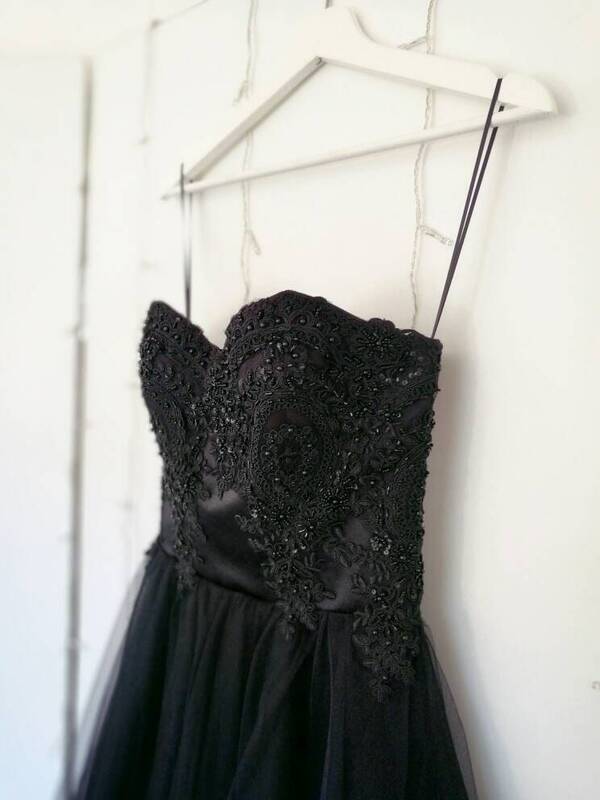 ANITA black gown wants to celebrate the femininity of every woman who feels a romantic dreamer. It is a long dress inspired by the italian divas of the 50s movies. An authentic artisanal italian cloth, totally hand made in Italy, a one-of-a-kind cloth to love, wear and keep jealously in the wardrobe before passing down to your own daughter. Hand embroidered appliques (with or without beads). Sizes: this is a made to measure product. Please provide your measurements. This dress is available in black and white. If you're looking for a different shade of color, please contact me: I'll do my best to create your dream dress. This item is made to order and customizable. Send me a convo to let me know your needs.